The Wireless Host ("station") needs to associate with an access point (AP) before it can send/receive network-layer data. This is a basic 802.11 system management function. Association = creation of a “virtual ethernet wire” between the station and the switch. Locate an AP to associate with…this process can involve passive or active scanning as discussed below. 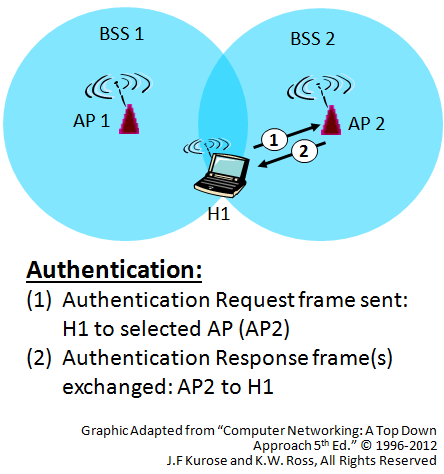 Authenticate itself to the AP (and possibly the Infrastructure). Associate with the AP (create the "virtual" blue cable). Now, the station can retrieve an IP address from the subnet and begin TCP/UDP socket communications. The first step is to locate the AP you wish to join. 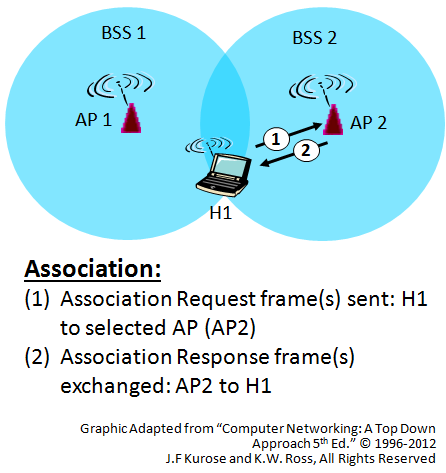 The algorithm for locating/selecting an AP is not defined by the 802.11 standard, but rather by your application. 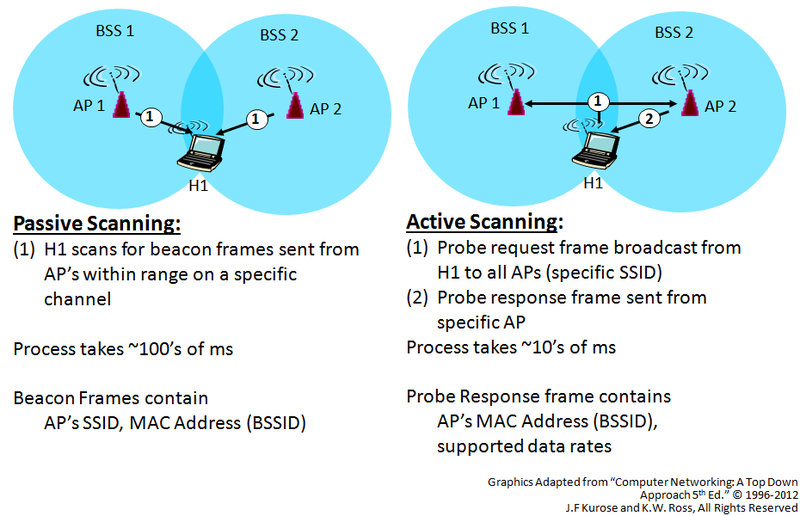 There are 2 methods provided in 802.11 to discover APs near the station: Passive and Active Scanning, which are illustrated below. In a typical application, one of several possible commissioning methods are deployed to get a specific AP's network parameters into your application (channel, SSID, security). After copying these parameters to your Wi-Fi® sub-system's connection profile, your application will call a "WiFi_Connect()" API which uses an Active Scanning method to connect to this specific AP. Next, the station attempts to authenticate itself to the AP (at a minimum) and possibly the network. The final step in creation of the virtual blue wire. After association is complete the DHCP process can begin…to assign an IP address to the station and enable the application to connect with other hosts on the network. Association request/response frames are exchanged. Final bit rates and security parameters are agreed upon. Now, 802.11 data frames can be sent between the station and AP.